When you’re looking for ideas on how to remodel your kitchen, you probably spend most of your time doing in-depth research. When you’re looking for ideas on how to remodel your kitchen, you probably spend most of your time doing in-depth research. This research could be watching home design shows on television or scouring the Internet for inspiration. 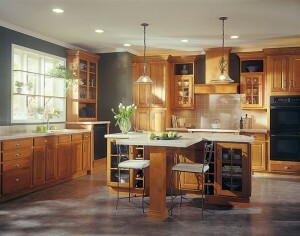 But once you’ve settled on what you want your redone kitchen to look like, there are a few more things to think about. The first thing you need to take into account is the purpose of the kitchen remodeling project. Why does it need to happen? When the renovations are finished, you’ll have a beautiful kitchen without a doubt. However, that won’t always be your only objective. If you’re trying to open up your kitchen, then a remodeling project is one great way to achieve that goal. Now that you know what you want, you’ve got to start making a coherent plan for it. It’s easy to think that a full remodel won’t last longer than a weekend, or a week at the most. That’s a common misconception that can lead you into trouble. Make a drawing of your current kitchen that includes all of the elements in it – that way, you won’t end up buying appliances that are too big or too small. Think about the trends in kitchen design that you want to follow. Then, decide how you want to make your kitchen more accessible for everyone. At some point, it’s possible that your remodeling project will fall behind. The weather can present an obstacle, especially as fall turns into winter. It’s also possible that contractors could get sick, or the materials you want are on backorder. Although you may be concerned about your budget, you shouldn’t hesitate to choose the highest quality materials that you can afford. Make sure they aren’t high maintenance but also come with extended warranties. Unless you have an outdoor kitchen, preparing and cooking meals may be more difficult. This is because during the remodeling process, your indoor one will be basically inaccessible. While you could go out to eat or visit with friends and family, you need to think of other solutions. After all, your budget will already be strained. Consider taking the microwave and other small kitchen appliances out of the kitchen and putting them in a different room for now, at least until the remodeling process is complete. Capital Remodeling is ready to transform and beautify your kitchen in Maryland, Northern Virginia, and Washington DC this fall and winter with affordable kitchen remodeling that will exceed your expectations. With our quality kitchen remodeling services, reasonable prices, and flawless customer service, you will love the end result. If you’re ready for a free quote, visit us online or give us a call at 1-844-320-9847. If you’d like to see our previous projects, follow us on Facebook, Pinterest, Houzz, Twitter, Google+, LinkedIn, and YouTube. This entry was posted on Wednesday, November 14th, 2018	at 9:34 AM	and is filed under Kitchens	. You can follow any responses to this entry through the RSS 2.0	feed. Both comments and pings are currently closed.